One of the cold hardiest selections of this species native to New Zealand. 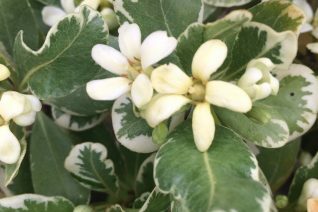 This stunning evergreen shrub of unknown origin shines in the garden with round leaves edged in white with an interior of soft green. And these bright leaves are held on dramatic black stems. In spring small black to maroon flowers decorate the leaf axils. Moderately fast growing pyramidal shrub to 8′ tall x 4 wide in 7 years- and gradually larger. In winter the leaves become even more colorful taking on bright pink tints. Requires a somewhat protected location- avoid exposure to subfreezing winds directly. Best sited with protection from east winds. Full sun to high over head shade. Accepts regular summer water which will increase the rate of growth- but established plants are remarkably summer drought tolerant. Excellent cut foliage for arrangements. A luminous shrub that virtually glows in the landscape. Cold damage begins at about 10ºF- but spring recovery is rapid. Limited quantities. An old shrub that deserves a new lease on life. Venerable old specimens are found throughout Portland proving its durability over time. The rounded evergreen leaves are edged in cream with an interior of soft sage green. In May/June masses of small white deliciously citrus-blossom scented flowers perfume a wide area. Not as dense or fast growing as the species- and prone to losing older leaves in colder than normal winters- so it can have an open appearance. Excellent evergreen specimen shrub for a hot location. A south or west facing wall is ideal and it can withstand the most withering afternoon heat. Slow growing to 6′ x 6′ in 10 years. Very drought adapted when established, but it will happily take regular summer water. The foliage is so fetching that it is often seen for sale as cut material in bouquets. It lasts for several weeks in a vase. Full sun to quite a bit of shade. Nice foundation shrub. Established shrubs are cold hardy to about 5ºF. Avoid exposure to strong subfreezing winds. Easy and pretty urban plant. 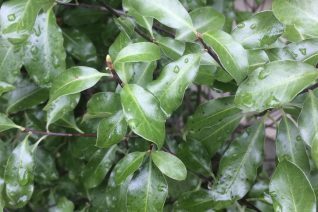 Unless you look REALLY REALLY closely you would never even think this was a Pittosporum, let alone even in that family. But life was tough in alpine New Zealand and this baby would have none of the grazing by huge Moa Birds. So the twiggy, zig zaggy stems evolved (the official term is divarication). The tiny, tiny leaves are serrated if you look closely (you might even take out glass to amplify the details). Tiny white flowers line the stem and mostly go unnoticed in spring. 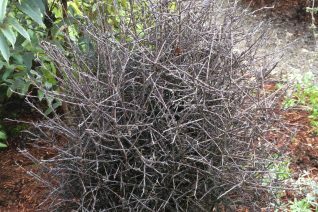 What it does provide is a very architectural compact shrub with stunning black stems in winter that change to ashy grey in summer. Perfectly hardy to cold down to below 5ºF. Full sun and average to enriched soil with little summer water once established. Groovy, somewhat rare shrub for excellent effects. To 6′ x 3′ in 8 years. Moderate deer resistance. Great structural shrub for containers. 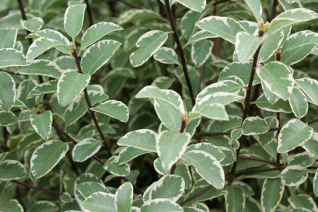 Surprisingly hardy and spectacular variegated evergreen shrub for protected locations. Each sage green glossy leaf is margined in white and held on contrasting black stems. Very very pretty shrub to 5′ x 4′ in 7 years. In spring small jet black flowers emerge from the leaf axils. 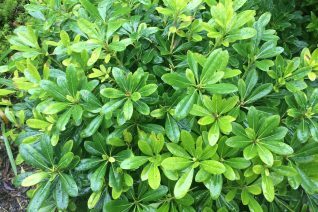 Best surrounded by other evergreen shrubs against a wall or with light overhead protection. This cultivar has come through low’s below 10ºF with only light tip damage and recovery was complete in spring. Slightly tender when a young plant it gains cold hardiness with establishment. Takes pruning very well which will increase the plants density. Great in containers that you protect from lows below about 18ºF. Excellent performance at the Oregon Coast. Do not plant this in a location exposed to strong subfreezing east wind- keep it close with friends. New Zealand. Extremely drought tolerant in full sun to part shade. Useful somewhat formal looking ground cover shrub that is always good looking . To 2′ x 3′ slowly the dense deep green foliage is arranged handsomely. In May/June clusters of off white fragrant flowers appear- Not as heavily as the species but pretty none-the-less. Excels in hot dry situations- including the reflected heat of walls. Hardier to cold than generally thought. My 10 year old plants have never been damaged by cold- down below 10ºF. Avoid freezing cold exposed sites, however. Useful as a massed weed smothering ground cover. Deep green uniform appearance of foliage is just what many people are seeking. Drought tolerant. Evergreen. Hardy to 5ºF when established. Excellent appearance year round. 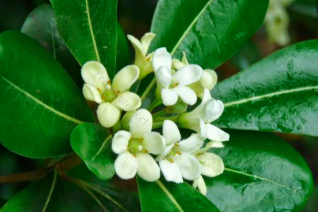 Large growing evergreen shrub that we love because in spring each branch tip is home to masses of tiny offwhite flowers that pump out a sweet and pervasive citrus blossom perfume. Fast growing to 8′ x 8′ in 6 years. Full sun and well drained soil. Incredibly drought tolerant when established. Totally cold hardy and an excellent hedge. Fantastic performance in tough urban environments. Foliage is thin and glossy and good looking year round. 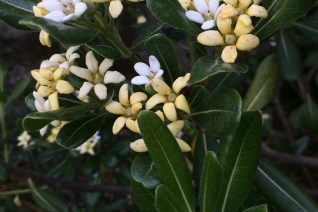 Easy, fragrant shrub. Water to establish then little summer water when firmly happy. Prune AFTER blooming has ended in late spring. 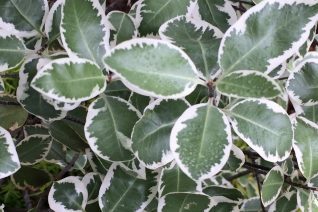 Groovy evergreen cold hardy Pittosporum that provides unusual textural effects. Long thin leaves are glossy and bright green and only 1/3″ wide they stretch to 5″ long. Wispy effect of a shrub to 8′ tall and 5′ wide in 6 years. Adaptable to any soil type aside from boggy. Incredibly drought tolerant- established plants need little summer water whatsoever. Full sun to quite a bit of shade. Forms an umbrella shape in time and casts very light shade. In spring not very conspicuous little yellow flowers appear at the end of thread like stems. Cold hardy and long lived. Fantastically graceful. Prune after blooming in late spring. May be pruned hard as there are numerous dormant buds along the stems- and will re-sprout from bare trunks. Brush heavy snow off this shrub- its cold hardy enough not to require winter protection. SW China. Seed from the northern extent of its natural range in Korea has yielded this cold hardy tough and wonderful evergreen shrub. 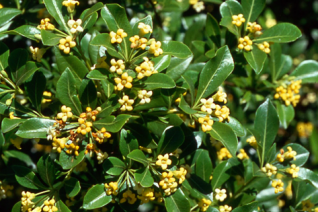 AKA evergreen mock orange this dense growing shrub displays white then yellow small flowers in May and June with the pervasive sweet fragrance of citrus blossoms. Incredibly drought tolerant and moderately fast growing. It also tolerates regular irrigation. To 8′ x 8′ in 6 years. Fully one zone hardier to cold than the species form typically seen in our gardens. Formal looking shrub that was more popular in the mid-20th century. Deep green matte foliage has leaves curled under at the sides. Prune if needed AFTER flowering has ended in late spring- blooms on wood from the previous year. Always handsome foliage is used as cut material- it remains good looking for weeks in a vase or even as a wreath. Long lived, somewhat formal, easy shrub. We selected this form of New Zealand Pittosporum because been cold hardy in Portland for the past 15 years! Not bad- for a genus that can range to tender. 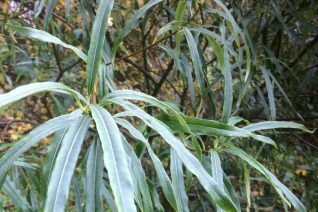 Upright growing evergreen with deeply hued glossy foliage with wavy edges. Black stems support the leaves and provide elegant contrast. In mid-spring small but profuse jet black flowers appear on the stems from the previous years growth. Prune, if needed AFTER spring bloom has ended. To 5′ tall and 3′ wide in 7 years. Full sun to part shade in a protected location. We selected this form after enduring temperatures below 10ºF with no damage. Slow growing shrub with great drought tolerance. Always fresh and good looking. Light water speeds growth in summer. Avoid full exposure to subfreezing east wind. Best on a west or south facing aspect. Nice as formal sentries to a sunny entrance. Great urban performance. Fantastic performance at the Oregon Coast.